For the war, see Yom Kippur War. Yom Kippur (/ˌjɒm kɪˈpʊər, ˌjɔːm ˈkɪpər, ˌjoʊm-/; Hebrew: יוֹם כִּיפּוּר, IPA: [ˈjom kiˈpuʁ], or יום הכיפורים), also known as the Day of Atonement, is the holiest day of the year in Judaism. Its central themes are atonement and repentance. 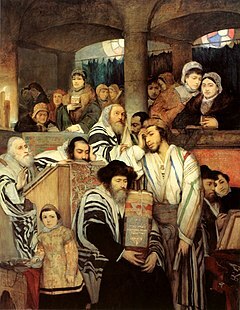 Jewish people traditionally observe this holy day with an approximate 25-hour period of fasting and intensive prayer, often spending most of the day in synagogue services. Yom means "day" in Hebrew and Kippur comes from a root that means "to atone". Yom Kippur is usually expressed in English as "Day of Atonement". Virtually all Jewish holidays involve meals, but since Yom Kippur involves fasting, Jewish law requires one to eat a large and festive meal on the afternoon before Yom Kippur, after the Mincha (afternoon) prayer. This meal is meant to make up for the inability to eat a large meal on the day of Yom Kippur instead, due to the prohibition from eating or drinking. The main section of the Avodah is a threefold recitation of the High Priest’s actions regarding expiation in the Holy of Holies. Performing the sacrificial acts and reciting Leviticus 16:30, ("Your upright children"). (These three times, plus in some congregations the Aleinu prayer during the Musaf Amidah on Yom Kippur and Rosh Hashanah, are the only times in Jewish services when Jews engage in prostration, with the exception of some Yemenite Jews and talmedhei haRambam (disciples of Maimonides) who may prostrate themselves on other occasions during the year.) A variety of liturgical poems are added, including a poem recounting the radiance of the countenance of the Kohen Gadol after exiting the Holy of Holies, traditionally believed to emit palpable light in a manner echoing the Torah's account of the countenance of Moses after descending from Mount Sinai, as well as prayers for the speedy rebuilding of the Temple and the restoration of sacrificial worship. There are a variety of other customs, such as hand gestures to mime the sprinkling of blood (one sprinkling upwards and seven downwards per set of eight). Goat for Azazel The Kohen Gadol left the Haichal and walked to the east side of the Azarah (Israelite courtyard). Near the Nikanor Gate, he leaned his hands (Semikha) on the goat "for Azazel" and confessed the sins of the entire people of Israel. The people prostrated themselves when he pronounced the Tetragrammaton. While he made a general confession, individuals in the crowd at the Temple would confess privately. The Kohen Gadol then sent the goat off "to the wilderness". In practice, to prevent its return to human habitation, the goat was led to a cliff outside Jerusalem and pushed off its edge. The Kohen Gadol wore five sets of garments (three golden and two white linen), immersed in the mikvah five times, and washed his hands and feet ten times. Sacrifices included two (daily) lambs, one bull, two goats, and two rams, with accompanying mincha (meal) offerings, wine libations, and three incense offerings (the regular two daily and an additional one for Yom Kippur). The Kohen Gadol entered the Holy of Holies three times. The Tetragrammaton was pronounced three times, once for each confession. Yom Kippur is a legal holiday in the modern state of Israel. There are no radio or television broadcasts, airports are shut down, there is no public transportation, and all shops and businesses are closed. Some notable athletes have observed Yom Kippur, even when it conflicted with playing their sport. Former Los Angeles Dodgers outfielder Shawn Green, similarly, made headlines in 2001 for sitting out a game for the first time in 415 games (then the longest streak among active players), to honor Yom Kippur, even though his team was in the middle of a playoff race. Other baseball players who have similarly sat out games on Yom Kippur include former Boston Red Sox and New York Yankees third baseman Kevin Youkilis, former Houston Astros catcher and current Los Angeles Angels manager Brad Ausmus, and outfielder Art Shamsky. ^ It can be argued that the weekly Sabbath (Shabbat) is holier. See Shabbat (Status as a holy day). ^ Cohen, S.M. ; Eisen, A.M.: The Jew Within: Self, Family, and Community in America, p. 169. Indiana University Press, 2000. "For completely uninvolved Jews ... the question of synagogue attendance rarely arises. They are unlikely ever to consider the matter, except at Rosh Hashanha and Yom Kippur or to attend a bar or bat mitzvah." See also Samuel C. Heilman, Synagogue Life, 1976. ^ "Erev Yom Kippur – The purpose of the day as seen through Talmudic anecdotes (PDF)" (PDF). Retrieved March 25, 2011. ^ a b "Why Rabbis wear sneakers on their holiest day". "Article by Avi Rabinowitz, NYU homepages"
^ "OU Customs for Erev Yom Kippur". Retrieved September 21, 2008. ^ "Jewish Virtual Library – Yom Kippur". Retrieved September 21, 2008. ^ "Halacha L'Maaseh: Yom Kippur". Retrieved September 20, 2015. ^ a b Rabbi Daniel Kohn. "My Jewish Learning – Prayer Services". Retrieved May 22, 2017. ^ Green, David B. (September 26, 2011). "Lawrence A. Hoffman and the message of Kol Nidre". Haaretz. Retrieved September 14, 2013. ^ a b c Arnold Lustiger, Michael Taubes, Menachem Genack, and Hershel Schachter, Kasirer Edition Yom Kippur Machzor With Commentary Adapted from the Teachings of Rabbi Joseph B. Soloveitchik. New York: K'hal Publishing, 2006. pp. 588–589 (summary); 590–618. ^ "Rosh HaShanah and the Gregorian calendar". Oztorah.com. Retrieved September 12, 2012. ^ "Sounds of The City". Israel Insider. October 14, 2005. Archived from the original on February 17, 2007. ^ "Poll: 73% of Israelis fast on Yom Kippur". Ynet. September 13, 2013. ^ "Public Radio International, "The World", 'Yom Kippur: Kids and Bikes in Tel Aviv'". Theworld.org. Retrieved 7 March 2015. ^ Solomvits, Sandor. "Yom Kippur and Sandy Koufax". JewishSports.com. Archived from the original on October 18, 2006. Retrieved August 2, 2010. ^ a b Peter Dreier. "How Will Jewish Ballplayers Handle the Yom Kippur Quandry?[sic]". Huffingtonpost.com. Retrieved September 14, 2013. 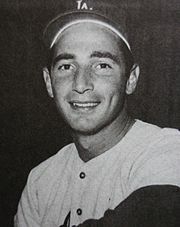 ^ "Came Yom Kippur: A Hank Greenberg Poem". baseball-almanac.com. Retrieved July 20, 2016. ^ "Green, Koufax and Greenberg – same dilemma, different decisions". ESPN. September 26, 2001. Retrieved March 25, 2011. ^ Brown, M. Stephen. "One on One with Kevin Youkilis". JewishSports.com. Archived from the original on May 5, 2009. Retrieved June 4, 2009. ^ Gammons, Peter (September 29, 2001). "Apolitical blues". ESPN. Retrieved March 18, 2010. ^ "Where Are They Now – Art Shamsky". Baseball Savvy. September 14, 2004. Retrieved September 10, 2010. ^ a b Hirsch, Deborah (December 27, 2010). "Gabe Carimi: Star in shul and on the football field". JTA. Retrieved February 9, 2011. ^ Andrea Waxman (October 5, 2007). "Yom Kippur, then football; Carimi fasts and then tackles". The Wisconsin Jewish Chronicle. Archived from the original on September 28, 2011. Retrieved February 9, 2011. ^ Madeline Miller (December 17, 2010). "The Biggest Thing in Jewish Sports? 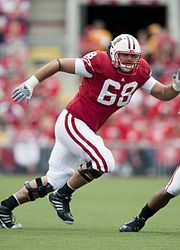 UW Gridiron Great Gabe Carimi". Hillel.org. Retrieved March 18, 2011. ^ Chris McCoskey (February 25, 2011). "Combine Leftovers". Detroit News. Archived from the original on July 9, 2011. Retrieved March 2, 2011. ^ Craig Ellenport (February 24, 2011). "Why is this prospect different from other prospects?". NFL.com. Retrieved March 2, 2011. ^ Ivan Maisel (September 27, 2004). "Bernstein feasted on Penn State after fasting". ESPN.com. Retrieved October 7, 2011. ^ a b c Saval, Malina (October 14, 2011). "Golf / Israelis abroad / Beck follows in Koufax's footsteps". Haaretz. Retrieved September 17, 2013. ^ Soclof, Adam (October 7, 2011). "The original Sandy Koufax of women's golf". Jewish Telegraphic Agency. Retrieved September 17, 2013. ^ "Gelfand and Grischuk winners in 4th round London Grand Prix". ChessVibes. Archived from the original on September 26, 2013. Retrieved September 14, 2013. ^ "Israeli tennis players fined for sitting out Yom Kippur". The Times of Israel. 12 August 2013. Retrieved 6 June 2015. ^ a b c d Tal Trachtman Alroy (19 December 2015). "U.N. recognizes Yom Kippur as official holiday". CNN.com. ^ a b c d Singer, Isidore; et al., eds. (1901–1906). "article name needed". The Jewish Encyclopedia. New York: Funk & Wagnalls. ^ a b Singer, Isidore; et al., eds. (1901–1906). "Atonement, Day of" . The Jewish Encyclopedia. New York: Funk & Wagnalls. Look up Yom Kippur in Wiktionary, the free dictionary. Wikimedia Commons has media related to Yom Kippur.